For some years now The Cricketer has run a regular column in which a variety of writers have written pieces titled My Favourite Cricketer. In the May 2013 edition Gulu set me thinking when his contribution appeared, a tribute to the late Eknath Solkar, known throughout the cricket world simply as Ekki. If the phrase had been invented in his time Ekki would certainly have been called a ‘bits and pieces’ cricketer. In the 1960s the alternative description often applied to him was a ‘poor man’s Sobers’. It wasn’t a comparison well made in relation to most it was applied to, but it did work rather well with Ekki. Like the great man Ekki was a left handed cricketer. His batting could be aggressive, and on occasion he opened the Indian batting, although his usual position was in the lower middle order. His highest Test score and only century came from the pivotal role of first drop, and whilst he might have lacked the technique of a Barrington or a Boycott, he could cling tenaciously on to his wicket with the best of them. With the ball Ekki was not, like Sobers, three dimensional, but he did have two styles. In the main he bowled a bit of medium pace, primarily to get some of the shine off the ball before the spinners got to work, but he began as an orthodox left arm spinner, and was an occasional tweaker throughout his career. Not even a great admirer like Gulu would seek to suggest that as a batsman or bowler Ekki could compare with Sobers, but Sobers’ had a third string to his bow. He was also a magnificent short leg fielder, some might argue the very best. Ekki was a short leg as well, and in that discipline of the game was at least Sobers’ equal and many who saw them both would say his superior. He was also a wonderful outfielder, fast across the ground with a swift pick up and an accurate flat throw, but few recall that as he rarely spent much time more than a few yards from the bat. Cricket was always a big part of Ekki’s life. His father was a groundsman at the Hindu Gymkhana ground in Bombay. It was not a well paid position, and it was a struggle to bring up a family of six in a single room at the ground. Ekki was just ten when he was invited to bowl in the nets and it wasn’t long before he came under the watchful eye of Vinoo Mankad. Armed with Vinoo’s advice Ekki was able to spent many hours working on his game at the Gymkhana ground. On the field Ekki developed quickly and led the Indian Schools side that beat their English counterparts 1-0 in 1965/66. After that, the large Solkar family struggling on Ekki’s father’s modest earnings, Ekki got a job in a bank after leaving school. Before too long he moved on to work for a major Bombay company, Mafatlal Industries. There was still plenty of time for cricket however, and it wasn’t long before Ekki made his mark with sufficient runs and wickets to earn a place in the immensely powerful Bombay side of the time. In February 1969, just before the Ranji Trophy final, tragedy struck the Solkar family as Ekki’s father fell downstairs at the Gymkhana ground and went into a coma. Ekki decided to play on, but on the morning of the third day of the match his father died. The match was at a crucial stage with Bombay 77 short of a lead on first innings that would in all probability prove decisive. Their last two recognised batsmen were at the crease, Ekki and a fellow 20 year old, Milind Rege. Ekki spent the early hours of that third morning lighting the fire at his father’s cremation before having to leave the ceremony in order to resume his innings. Despite the burden of grief he was carrying Ekki and Rege saw off the Bengali new ball attack and set their side well on the way to their target. His reputation growing a couple of weeks later Ekki helped West Zone to lift the Duleep Trophy, and then he left India in the hope he would be able to further his cricket career in England. In 1969 Ekki topped the bowling averages for Sussex seconds, a feat he repeated the following year as well as finishing second in their batting averages. He never found a way into the county game though. Eventually, in 1972, the TCCB registration committee, who were becoming increasingly resistant to allowing overseas players into the English game other than on the strictly regulated special registrations, decided not to allow Ekki a residential qualification. So there was only one First Class appearance for Sussex, against the 1969 New Zealanders. Wisden was full of praise for Ekki as he took three wickets in the tourists’ first innings and kept them out at the end of the game with the sort of determined rearguard action that was to delight his followers in years to come. As was almost always to be the case however it was his fielding that took pride of place, his three catches coming in for special mention. All were in the outfield deep on the leg side, demonstrating that versatility. 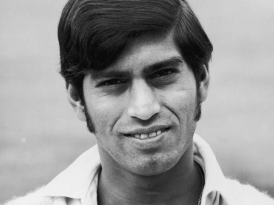 Back home in 1969/70 Ekki earned his first Test cap when was selected in favour of all-rounder Rusi Surti for the third Test against the touring New Zealanders. He bowled just three overs in the match, and scored 0 and 13*, but in fact his contribution was not quite as anonymous as that seems. He might have become the first Indian to take a wicket with his first ball in Test cricket but, depending on which account you prefer, a chance was either put down by or fell just short of Venkat in the leg trap. In the Indian second innings he was there at the end in what was a fight against defeat. He batted for 45 minutes and cover drove and hooked Dayle Hadlee to the boundary. Indian writer Rajan Bala described the knock as the silver lining of an innings which was otherwise a dark and disgusting cloud. India were 76-7 after being out for 89 in the first innings when rain washed away any prospect of the victory New Zealand deserved. Almost as soon as the New Zealanders left India Australia arrived for what was only their second full series on the sub-continent. For the first Test Surti was back and Ekki relegated to twelfth man, but Surti achieved little and Ekki was back in for the rest of a series that was won 3-1 by Australia. He made sure that there was no way back for Surti after the drawn second Test. First of all he scored 44 in the first innings, described as exuberant by Wisden, and added 35 more in the second. He shared the new ball with Subrata Guha and bowled nineteen economical overs as well as taking his first Test wicket, that of Ian Redpath, caught by Guha at backward square leg from a mis-timed sweep. India levelled the series in the third Test although Ekki contributed little. There were defeats in the fourth and fifth Tests for India despite more useful batting from Ekki in the fourth and, as he ended the series with as many as ten catches, his reputation in the field was firmly established. By 1970 India had been playing Test cricket for almost forty years without ever having taken a Test series overseas. That changed, entirely unexpectedly, when Sunil Gavaskar emerged in the Caribbean in the 1970/71 series. Gavaskar missed the first Test and India’s batting star was Dilip Sardesai with 212. He would not have got anything like so many without Ekki however, whose 61 was the only other significant contribution. The only definite result in the series came with India’s victory in the second Test where there was another half-century from Ekki, 55 this time, but more importantly he held six catches as Bishen Bedi, Erapelli Prasanna and Venkat cast their spells over the West Indian batsmen. The remaining three Tests were all drawn, the West Indies only really being in a winning position in the fourth. To help thwart them Ekki, in company once again with Sardesai, contributed his highest Test score to date of 65. By all accounts he had a few tricky moments along the way, but he toughed it out for four hours, and in the second innings, as he had been on debut, he was there at the end, this time with Gavaskar. There wasn’t a long wait for India’s next away victory which, just as unexpectedly, came in England. There was a degree of good fortune for India in the first two Tests, but they fully deserved their victory at the Oval. For Solkar the series was a great success and in fact he topped India’s series averages with the ball. There were only 58 overs and six wickets in the three Tests, but they cost just 22.83 and, not for the only time, he seemed to have the measure of one of England’s openers. This time it was Brian Luckhurst whose wicket he took three times in the Tests, twice with just a single to his name. The English language was not Ekki’s specialist subject, but he knew enough to make sure that he could give as good as he got when it came to sledging. When, in his first innings of the series, Luckhurst was caught by Ekki from Chandra’s bowling the England opener was irritated by Ekki’s broad grin and warned him; Just you wait, the series isn’t over yet. When Luckhurst was the seventh man out in England’s first innings at the Oval Ekki asked in his broken English; Is the series over yet? The series was an all-round success for Ekki as, with an average of 42.00 against Farokh Engineer’s 43.00, he was second in the batting averages as well as heading the bowling. In the first Test a defiant 67, scored in five hours, helped India to a narrow first innings lead and, in trouble and with eight down when the rains saved them, Ekki was again there to see his team over the line. In the second Test he came to the wicket with India 104-5 in response to England’s 386, and helped Sunil Gavaskar steer the innings to respectability with exactly 50, in rather more fluent fashion than in the previous game. In the famous win at the Oval Ekki played a full part, although for once he wasn’t there at the end. England’s first innings saw him record what were to remain his best Test figures, 3-28 in 15 overs, his victims being Luckhurst, Alan Knott and John Snow. His 44 in India’s reply helped to keep them in touching distance and whilst he bowled just three wicketless overs in India’s second innings before Bhagwhat Chandrasekhar began his historic spell he still played a key part, these superb catches to get rid of Keith Fletcher and Knott being crucial. Wisden was effusive in its praise of Ekki’s role in the series, the editor writing that his batting not only improved in technique, but also acquired a refreshing, positive personality. The comment on his fielding was the simple one that he shone in all positions. When England visited the sub-continent in 1972/73 without, for various reasons, Ray Illingworth, Snow and Geoff Boycott, they started as underdogs. Despite that the side led by Tony Lewis shocked the locals by taking the first Test by six wickets. It was in this match that Ekki made his only significant contribution with bat or ball as he scored 20 and 75. In his other eight visits to the crease he scored just 90 more runs. With the ball he took the new ball in each and every one of England’s nine innings – despite that he, remarkably, only bowled 25 overs altogether, and took not a single wicket. But those disappointing returns didn’t put Ekki’s place in jeopardy or prevent him being a match winner. His twelve catches made a huge difference, Wisden described him as spending the series jumping around like a hungry trout, and without his catch to dismiss skipper Lewis in the second Test India might not have won that match by 28 runs, their platform for taking a decisive lead in the third Test. Of the catch Erapelli Prasanna later wrote Solkar’s catching was incredible. The catch which dismissed Lewis, who made a full blooded sweep off Bedi, was out of this world. How he, standing perilously close at forward short leg, even saw the ball I don’t know. I can’t think of anybody else taking that catch. When India arrived in England in 1974 it was on the back of three consecutive series victories and, with their team essentially unchanged, they must have had high hopes of further success. As events turned out however the series was an unmitigated disaster. Defeat in the first Test by 133 runs was comprehensive enough, but turned out to be their best showing. India had tried to accommodate an extra seamer by playing Madan Lal in Ekki’s place at number seven and asking Ekki to open the batting with Gavaskar. In the second innings Ekki did hook Bob Willis’ first delivery to him for six, but all in all the experiment was not a success. For the second Test Ekki was back down to six but the next two Tests were lost by an innings. At Lord’s India had the ignominy of being dismissed for just 42 in their second innings, and in the third Test they took just two English wickets in the entire game. On a personal level Ekki’s series was almost as disappointing as his country’s. He achieved little with the bat in the third Test, but he did manage 43 in the first innings at Lord’s, and without his unbeaten 18 in the second innings India might have threatened the record for Test cricket’s lowest ever total. Over the series as a whole Ekki’s fielding was as formidable as ever when the batsmen were persuaded to steer the ball in his direction, but with the ball there was just one wicket, but it was an interesting one. The story begins at Bradford when Boycott was dismissed cheaply in both innings, once by Ekki, lbw to an inswinger that came in a long way and caught Boycott shouldering arms, and once by his new ball partner Syed Abid Ali. A week later, playing for MCC, Boycott was twice caught at slip by Gavaskar, both times from Ekki’s bowling, for 12 and 1, and the media became interested in the idea that Ekki had some sort of hold on Boycott. The first Test was then a repeat of Bradford, Abid Ali dismissing Boycott early in the first innings and Ekki inducing an edge to Engineer in the second. The Yorkshireman was dropped for the next Test, and it was to be three years before he made himself available again for England. There were a couple of still remembered chirps in Boycott’s direction as well. After one dismissal Ekki’s parting shot was Go tell your Aunty, a reference, apparently, to Boycott’s girlfriend being older than him. Rather better known is a greeting; I’ll bloody out you! Did Ekki’s gentle seamers expose a flaw in Boycott’s technique? The man himself always maintained that his travails against him were coincidental, and caused by poor form and the problems he had going on in Yorkshire. Quite correctly he pointed out that he had never encountered any particular problems with other left armers, and he cited Liaquat Ali, Trevor Goddard and Richard Collinge. But there were and are some who maintain that Boycott’s ultra orthodox sideways on stance did not have the flexibility to deal well with the different line that left armers used. In any event in the 1970s for Indians everywhere Boycott was Ekki’s ‘bunny’, and they certainly aren’t going to change their minds after forty years. The Indians had a few months to lick their wounds before Clive Lloyd’s West Indians arrived for a five match series in 1974/75, but little changed. The first two Tests were taken by West Indies and Ekki contributed little. It was clear that the tactic of opening the bowling with Ekki and Abid Ali had run its course and both were dropped for the third Test, replaced by Karsan Ghavri and Madan Lal. India pulled one back and then won the fourth Test as well. For that game Ekki was back, to open the batting with Gavaskar, but he had no more success than in the first two games and was probably fortunate to retain his place for the final Test. For the decider Engineer moved up to open with Gavaskar, with Ekki coming in at first drop. Lloyd was able to declare his first innings at 604-6. India replied soundly and by the close of the third day were 171-2 with Ekki unbeaten on 76 after almost four hours at the crease. In putting on 168 with Gavaskar he had batted very well, and perhaps the close came too early for him. Next day his anxiety to get to his century was plain for all to see. He repeatedly played and missed at Andy Roberts and in the words of Sunder Rajan he died a thousand deaths before, to the delight of all present, limping over the line. Ekki was dropped on 94 and survived several confident appeals after the new ball was taken. It took him 75 minutes to get through the 90s, and the effort must have drained him. He got to lunch but surrendered tamely to an Arthur Barratt googly straight after the resumption. His first century having come in his 25th Test there were only two more appearances for Ekki at the game’s highest level. He played in one Test in each of the series in the Caribbean in 1975/76, and at home against England the following year. There were neither runs nor wickets in those two matches, and in India’s ten wicket defeat by Tony Greig’s men there were lapses in the field too, so there was no way back. Ekki was only 28 when he last played for India, but his form generally fell away and after captaining Bombay to victory over Delhi in the 1980/81 Ranji Trophy final he played no more, despite celebrating what was only his 33rd birthday just before the game. Statistically Ekki’s career is largely unremarkable. His 27 Tests brought him 1,068 runs at a modest 25.42, and 18 wickets at a costly 59.44 runs each. But it is his efforts in the field where the notable numbers are. It is a shame that there is no way of knowing how many runs he saved, and how few chances he missed, but we do know he held 53 catches altogether, and that no man with more than fifty catches to his name can boast an average of 1.93 per match. He was a supremely confident fielder and has his place in history as the very best of his type to ever grace the game. The degree of protection that close fielders enjoy today means that there can be no like for like comparison with those who have come afterwards. There was no helmet for Ekki, no shin guards or other protection. He even eschewed a box, and when questioned about that would respond simply with a question of his own; Why would I need one? After cricket life did not treat Ekki quite so well. He had problems with his family who found it difficult to accept his decision to take a Muslim bride, despite her converting to Hinduism. He suffered health problems as well, suffering from diabetes and later an unusual skin condition, leucoderma, the effect of which is to remove all trace of pigment from areas of the skin. This embarrassing condition, to which there is some stigma attached in India, made Ekki reclusive, and that would not have helped a propensity to overindulge in his consumption of alcohol. He died of a heart attack at his home in 2005 at 57. His passing brought a new wave of recognition for his talents. Chandra said I cannot imagine how badly off we spin bowlers would have been without him. He was just amazing. His very presence almost had the batsmen thinking twice about pushing forward, sentiments echoed by Bishen Bedi; We would not have been the same bowlers without him.